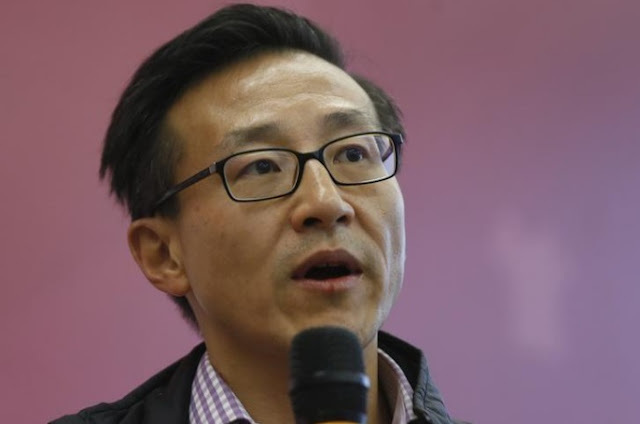 FILE PHOTO - Alibaba Group vice chairman Joseph Tsai attends a group interview at the company's headquarters in Hangzhou, Zhejiang province November 11, 2014. Chinese internet conglomerate Alibaba Group Holding Ltd denied on Thursday that its vice chairman, Joseph Tsai, is in advanced talks to buy a stake in the Brooklyn Nets of the National Basketball Association. Two sources told Reuters earlier on Thursday that Tsai was in talks to buy a stake in the Brooklyn Nets, valuing the U.S. basketball team at around $2.2 billion, and that a deal could be finalized in the next few weeks. They added it was possible that negotiations could collapse at the last minute. The sources declined to speak for attribution because they are not permitted to speak to the press. The exact size of Tsai’s possible stake could not immediately be learned. The Brooklyn Nets could not be reached for comment. A deal would make the Brooklyn Nets the second NBA team to be worth more than $2 billion, demonstrating the increasing value of these teams as TV networks and advertisers continue to pour money into live sports. As more viewers choose to watch their favorite shows “on demand,” live sports still drive people to watch the games in real time - which is valued by advertisers who have time-sensitive promotions. Last month, American casino mogul Tilman Fertitta bought the Houston Rockets for $2.2 billion, the highest price ever paid for an NBA team, according to media reports.